It's only a few more days before I resume my normal, ordinary life as an office worker. I've spent a wonderful summer in Marseille, almost daily in the Mediterranean shores, sometimes on a pebble beach, sometimes on sand. But always, always, facing the sea, enjoying the long summer days until the sun turns a rosé champagne color, before the sky turns a deep violet and then dark. I had lots of time to think, precious time that did not exist outside of the usual working life of getting on the morning commute, working, and then, exhausted, slipping into slumber and repeating the usual routine each day. The typical summer days for most of the French was a rarity for me. I want to have these simple days of just enjoying the summer fruits, the ripe peaches and apricots and cherries, hiking and seeing beautiful vistas, driving into the calanques and gazing upon beautiful views that is just breathtaking. Having the textured, white cliffs surround you, feeling close to nature, feeling like you are being transported into a peaceful yet savage place. I hope to carry a little of this magical feeling with me everyday when I am confronted with the daily dust of the everyday commute, the mundane bone wrenching crush of the crowds and the dreariness of knowing each day is yet another same-old day. It's harder than I thought. Already one month back doing nothing much but going to interviews for a job, I slip into a kind of lazy sickness, not being focused, mindlessly surfing the net, taking long naps, and so on. I admire people with the focus to do the same thing every day - such as running, or the gym. It's really hard to be so disciplined and worse, they take a lot of crap for it with other humans thinking that they are health freaks and do it just because they want to live longer. I don't really want to live that long, but I definitely want to live with a clarity of mind and mental energy that only comes from keeping a healthy lifestyle. I can't say that I'm getting better at being disciplined, but at least, every Saturday I do some hill-climbing on a tough route together with Dad. He's the one keeping me motivated, driving us there and waking up early. Other days I try to at least walk for certain distances - ideally 4 km but usually about 2 km. I've seen some amazing things in those 7 weeks. The total amount I've spent is only the cost of a branded handbag. It's really not much, and I'm thankful for those who put me up, pointed me to travel tips I could save some, and well, many things in life are free. The tap water in France tastes even sweeter than Evian, and the Spanish mother's home-cooked food, every meal for a week, was a delicious debt I could never repay. And the places I went, and the sights I've seen this year, priceless. 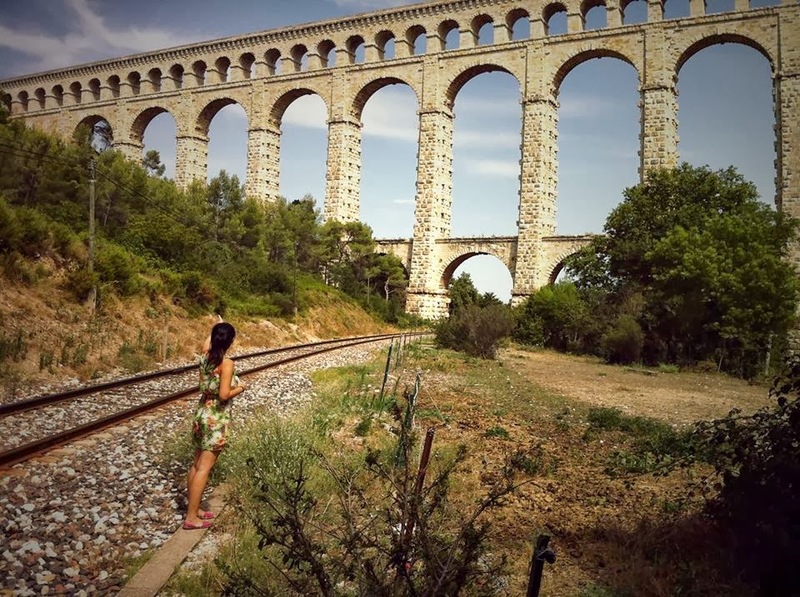 With the Frenchie, we went one day to see an aqueduct, it was one of the only two bridges built out of stone by the Romans - as shortly after, concrete was discovered. We saw an eagle, soaring into the sky. I cannot describe how amazing it was to see it, only that there's some kind of uplifting feeling felt in your heart. 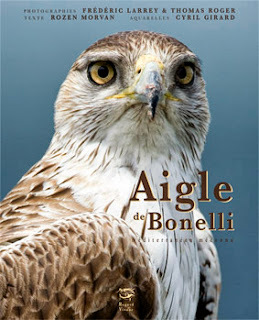 Sightings of eagles are super rare, and this eagle was an endangered species, an 'aigle du Bonnelli. Big fella! Aqueduc de Roguefavor- really amazing to see such a structure. It's used to carry a fresh water supply from the mountain ice and glaciers down into the city. We did not plan to go to Arles, an ancient Roman city about less than an hour away, but we had met a couchsurfer during a weekly meeting and he suggested to me to visit. Another climber friend of the Frenchie's told us that his brother who was a photography hobbyist, was in Arles as there was a great photography exposition going on there! It was a great trip and not only did I get to see so many outstanding works that would shape and inspire me, I also saw Sugimoto's colored polaroids of which I am a big fan. It's hard to describe but he uses a glass prism to reflect the spectrum of colors of the morning sunrise. And he would take polaroids of them. It's really an interesting concept and also a nice work that now has been reproduced on Hermes scarves as a limited edition. 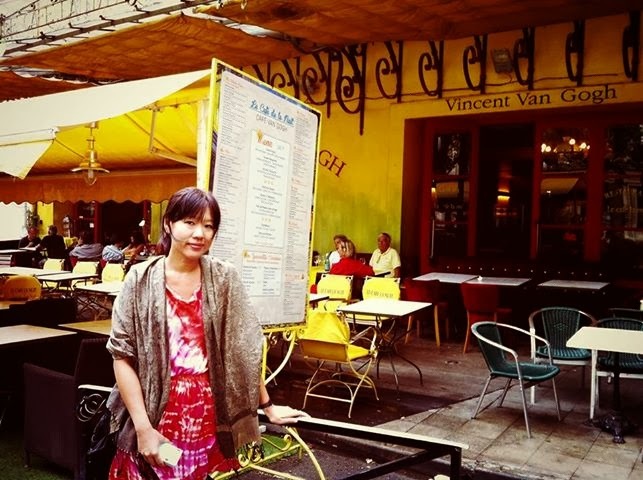 In Arles, we innocently stumbled upon the famous yellow walled cafe where Vincent Van Gogh had painted in the famous 'night scene at cafe terrace'. Having been very familiar with his works and other famous artists, it was just a moment that seemed unreal when we turned around from looking at a building and voila! There was the famous cafe, and we were not even looking for it or aware that it was in Arles! 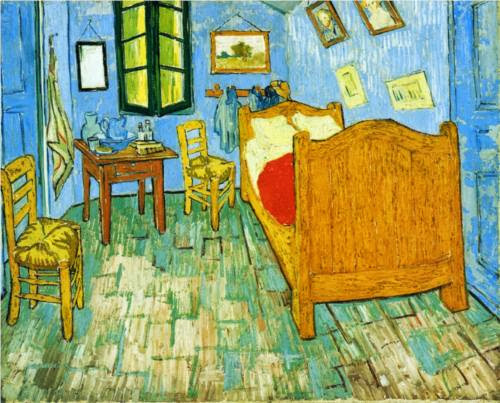 His other famous painting I had viewed in the Palais Longchamp, it was a scene of his bedroom where he lived in Arles. (The Frenchie has chairs that is seen in the painting. These chairs give me backache, they aren't so comfortable.) Really, I had never thought that I would be the type to want to see paintings, but it's just too amazing to be able to see it up close in my lifetime! As I had not planned for it and did not know that his paintings were in Marseille where I had stayed, the excitement and happiness was doubly great! I'm not the type of traveler that is a go-getter type, the 'I must see this monument', or 'I must eat this famous/exotic food where I travel to', kind of person. I just make the trip, and along the way decide if it's worth traveling so many hours for, or spending that kind of money for, to see this thing that everyone sees, or eat something that I never liked. I don't know if it makes sense, but I really like to have an authentic experience where I can. Sometimes my experiences are too authentic... such as staying in a small Spanish town where even my Valencian city dweller friend has never even heard of... and I was also staying in a small village in The Netherlands. Nope, I didn't go to Amsterdam. Nope, I didn't go to Madrid. Yes, it's a pity. But being in a crowded city all my life, I find more enjoyment in watching ducks swim by in the canals, and walking along empty village streets. I did see the windmills though I didn't plan to see them, and I totally did not regret it. Having read about the windmills in history books as a child, it was also a great experience to see the Kinderdijk mills, and being encouraged and directed to the place by my couchsurfer friend, the very second friend I had made there, and I had despaired of ever meeting him again. Well so we met! I'm glad for it. Maybe one day I will like to see the great monuments and fantastic buildings, but as one travel friend puts it, some types of vacations are meant for some types of people. What suits us may not suit them, and vice versa. It's nice to wander around aimlessly down narrow streets and discover interesting places, try nice cafes, explore what we can on foot. It's nice to spend summer days reading a book, thinking about happy things, and just cherishing the time we have together, knowing that it will be over, knowing that such times can come again. I think I can be a different kind of office worker, at least a happier one, when I remember my summer days.